Wow, I can't believe today marks the 4th anniversary of my first blog post! I was feeling so sentimental that we almost went out to eat tonight.... but then I just would have filled up on dinner and had no room for some crazy tasty dessert. Going out on a weekday isn't exactly easy, so I had a nice blizzard for lunch. The monthly flavor was sold out, so I went with the best-est blizzard of all time, the Reese's Peanut Butter Cup Blizzard. So tasty and so easy to make perfect. Like most blog posts, I've written this one in my head a half dozen times. I've thought about telling grand stories of how things have changed so much. I mean, I was getting like 11 hits a day for the first state of the freezer address, now many days we are over 1100, and I want to thank each and every one of you for checking back and following me as I navigate the 25 billion dollar U.S. ice cream industry with the help of my family, friends and all of your wonderful comments. This is the upstairs freezer and it doesn't have anything too secretive in it. 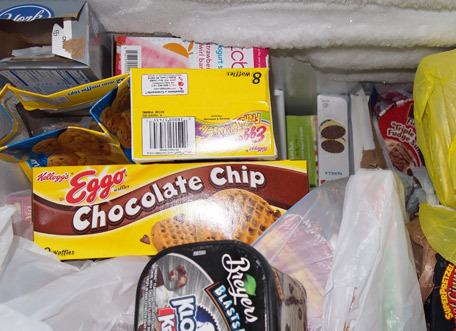 In fact, half of these items are just our attempts to get my son to enjoy frozen treats. We've got two kinds of coconut milk ice cream, rice dreams, tofutti cuties, edy's fruit bars, and popsicles just for him. On top of that we've got a half dozen containers of previously reviewed flavors plus there is always some B&J froyo around for my wife. If you look closely, there are a few more things buried on the other side of the basement freezer. 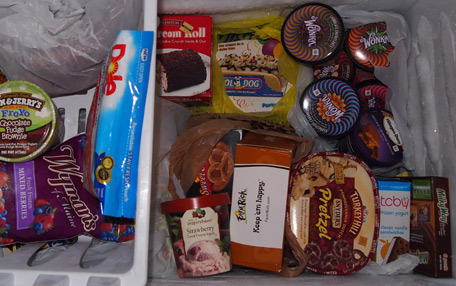 A container of Edy's, more TCBY that I've tried but not reviewed (sorry), some slim-a-bear sandwiches, and a very hidden (green) box of Jamba yogurt & sorbet bars (man I bought those awhile ago, freezer burn might be an issue). 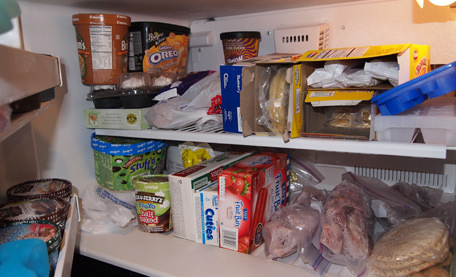 Actually I think there are even a few more things buried at the very bottom of the freezer. Oh man, that makes a total of 36 different flavors and treats.... ummm, yeah, I may need to slow down a bit. As you can see, I am as backlogged as ever. I really wish companies would spread their new products out a bit more. Don't get me wrong, I love the spring 2012 ice cream product line up, it's just so hard to keep up... but man, it sure is fun trying! Oh geez, it's late and I still need to watch the Castle finale and also see who wins the Voice (hey, I love music, what can I say)... man, I forgot all my stories. I guess I just want to say stick with me. This looks like an awesome season for ice cream and the blog. My short term goal is recovering from long term sleep deprivation, and after that we'll finally see.... well, I hope to see a lot less grammar errors actually. Hehehehe, ok, good night! You found the turkey hill flavor? I've still been on the lookout for it. At least now I can wait for your review to see if it's worth purchasing. Holy cow. I thought my backlog was huge. You've got me licked. Looking forward to the reviews! I just found it monday night! Happy four year anniversary! Love the State of the Freezer address and the blog. Keep up the good work and I look forward to all the new reviews. Looking forward to the TCBY and TH Pretzel reviews!